There are so many California tourist attractions, it’s hard to know where to begin. From Sea World-San Diego in the south to majestic Mt. Shasta near its northern border, California is without a doubt a vacationer’s paradise. Because the state is so large, travelers can seldom satisfy all their interests in a single trip, and the California Tourist Guide will help you pick and choose from the various California tourist attractions and help you focus your selections to design a dream vacation. So, what excites you? Is it a whale watching tour during the day followed by a sumptuous dinner that evening? Would you rather visit a few wineries and enjoy a picnic lunch? Does a hot air balloon ride sound fun or is a mud bath spa treatment your idea of heaven? How about taking a Segway™ tour of Sausalito? Do art and architecture make your heart sing? Which do you prefer: an afternoon of shopping in San Francisco’s Union Square or browsing through the Mission District’s thrift stores? Would you rather enjoy a glass of wine on a sailboat as the sun sets on the Pacific or does a Santa Cruz surf school sound like a better way to enjoy the ocean? Would you rather venture to a new locale every day or immerse yourself in one specific area? How long can you stay? What’s your budget look like? Are you visiting during the summer or winter? Do you prefer to set out on your own on foot or by car? Does leaving the driving to an organized tour operator make sense? Would your family enjoy cruising the Sacramento Delta for a week on a houseboat? Have you always wanted to see the desert in spring? Are you an avid golfer? Have you always wanted to see a television show being taped? Answering these questions should help you use the California Tourist Guide by narrowing down what area you plan to visit and what California tourist attractions will please you the most. One last question: Do you plan to stay up late enjoying the nightlife or jog on the beach at sunrise? Both, you say? Go for it! Just about everything is possible in California. Seriously. 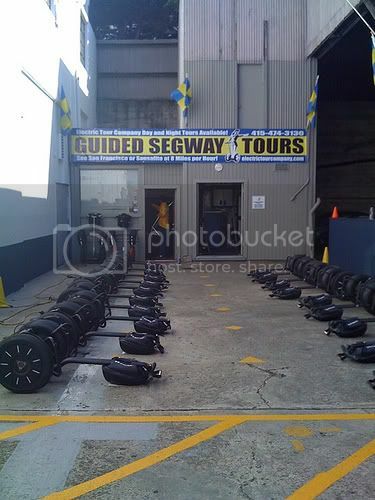 Photo of San Francisco Segway Tours by 177 via flickr (Creative Commons).